Mr Gawande discovered that the good checklist is short but not too short. If the list is long, none of the items on it are taken very seriously. You can easily persuade people to agree to things when you ask them to mechanically click or tick their way through a list of questions. Consider the lack of attention you give to the many privacy questions asked by websites or questions on an immigration form. It turns out you can easily persuade people to declare their involvement in genocide or intention to subvert the constitution of the US by inserting the relevant question in a long list of immigration queries, all of which expect the answer yes. But Mr Gawande’s most important discovery was that the power of the checklist came from a less obvious source. The list empowers members of a team to monitor each other. Adherence to the list allows the nurse to correct the surgeon, the co-pilot to review the captain. The successful travel list is likely to be a family rather than an individual endeavour. For my part, I've been experimenting with a combination of the two over the last few years. At first I started just developing a physical list, but it started to become too long because there were many examples I wanted to include, as well as other longer excerpts of things I wanted to include to help me think about a potential investment (examples are things like book passages on the capital cycle or the importance of focusing on expected returns when investing in a business with a moat). So what I've done is create a document with a bunch of checklist-type questions as well as passages of things I want to review continually over time. I mentioned this at the end of my post on fundamentals, and it has now taken the place as being the thing I review a little bit of almost every day. I still try and read a little bit of all the books mentioned in that post, but now I do that about every week or so instead of doing it as often as before since I've moved many of the key ideas into the compiled document, which now stretches over 100 pages long. I also continue to practice the routine I described in my post on memortation. This not only helps keep the important things almost always near the top of my mind, but it also provides a nice way for me to get focused in the morning and to get refocused when my mind begins to stray. Below is a current list I have together that I've found useful for myself. It will likely change a bit over time, and it probably isn't right for you. In fact, it is almost guaranteed not to be right for you. But it may be useful for some, and may give readers of this an idea for their own list, so I decided to post it. What’s the case for having a reasonable expectation of making a 26% IRR (i.e. a double/100% return in 3 years, or a 2.5x/150% return in 4 years)? While the actual expected return can be less if there is adequate downside, you want there to be a reasonable chance it can produce this IRR. If I need to get out of this because I am wrong, what will be the likely reason I was wrong on it (i.e. do a pre-mortem)? Are you sure this is within your circle of competence? What work have you done? Do you understand how the company stands in its industry and versus its key competitors? And remember to never underestimate competition, and that high returns tend to attract competition ‘like a moth to a flame’, and this includes businesses and entrepreneurs that aren’t even competitors yet. Is my upside 3 times greater than my downside? (And since most investments can be down at least 50% due to the unknown unknowables, you need to really look hard for growing businesses that you think will be worth about 2.5x where you are buying them over a 4-7 year period. And remember that growth can both create and destroy value, so it needs to be economically profitable growth). Is the business a good business? Does it earn high returns on capital? Does it have a moat that protects those returns from competition and allows reinvestment to also occur at a high rate? Prefer a business that does not require a lot of capital to grow (i.e. not too capital intensive) where much of the growth will be due to the company’s own actions (instead of relying on things like commodity prices, interest rates, etc.). The business needs to be in a Win-Win relationship with all of its constituents to be sustainable over the long term (customers, suppliers, employees, owners, regulators, and communities). Does it have a good balance sheet? Is there a conservative level of debt (and preferably, no debt)? Are there any off-balance sheet liabilities that I need to account for? Is the balance sheet structured to allow the company to take advantage of unforeseen opportunities or market crises should they present themselves? You want a company that can control its own destiny and not depend on the kindness of strangers (for access to capital, debt rollovers, etc.). Does it have good management? Look for “intelligent fanatics” who are owner-operators, and where the ownership was preferably gained through buying in the open market or from founding the company, as opposed to option grants where they got the upside without the corresponding downside risk. You want management teams with intelligence, integrity, and energy that pursue excellence in everything they do (products, people, etc.). Does management understand capital allocation? Management skill in allocating capital is extremely important. Is it trading at a good price? Is there a significant margin of safety? You need margin for error, because you are bound to make plenty of errors over time. So always consider the question, what if I’m wrong? Is this a good addition to a portfolio goal of having 6-12 mostly non-correlated positions (where a position may hold more than one stock if there is high correlation among certain ideas and they look about equally attractive to purchase together). When looking at a potential business, you need to take the mentality of buying the entire business, and retaining management. If you are buying the business as your only family asset and have to keep these people running it, how comfortable are you buying the business at this price? Make sure you are taking a fundamental, entrepreneurial view of the business and NOT an MBA/outside-investor-know-it-all type of view. What are the 1-3 main things that will drive this business, and what data can I use to track them over time? If you went away for 5 years and could only get updates on 1-3 business metrics to tell you how the business was doing, what would those key metrics be? (After assuring them their answer would be kept private…) If you had to buy the stock of any company in your industry, excluding your own, what company would it be, and why? Marathon looks to invest in two phases of an industry’s capital cycle. From what is misleadingly labelled the “growth” universe, we search for businesses whose high returns are believed to be more sustainable than most investors expect. Here, the good company manages to resist becoming a mediocre one. From the low return, or “value” universe, our aim is to find companies whose improvement potential is generally underestimated. In both cases, the rate at which a company reverts to mediocrity (or “fade rate”) is often miscalculated by stock market participants. Marathon’s own experience suggests that the resultant mispricing is often systematic for behavioural reasons. Chart 1.7 illustrates the “fade rate” of corporate returns, an idea developed by Holt Value Associates (now part of Credit Suisse). Holt’s concept of the stock market-implied fade rate chimed well with our focus on competitive conditions within industries and the flow of capital into (and out of) high (and low) return industries. Using this framework, two purchase candidates are identifiable. 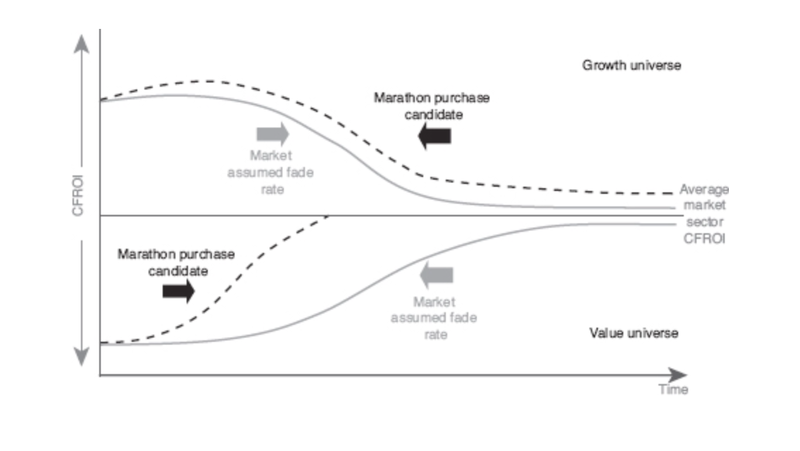 Purchase Candidate A is a company capable of sustaining high returns beyond the market’s expectation (the upper dotted line) – that is, the company remains above average for longer than average. Candidate B is a company which can improve faster than the market generally expects (the lower dotted line). Marathon’s experience suggests that the stock market is often poor at pricing superior fade characteristics. For Purchase Candidate A, mispricing stems from a number of sources. One is the underestimation of the durability of barriers to entry. Another is the underappreciation of the scale and scope of the addressable market. Management’s capital allocation skills are also often overlooked. A recent meeting with the CEO of Bunzl, the leading specialist business-to-business distributor, was instructive in this regard. While sell-side analysts covering the stock have made reasonably accurate forecasts of returns from the core business, they have consistently failed to give management credit for adding value via bolt-on acquisitions, despite 20 years or so of supporting evidence. Investors also appear to be biased against “boring” high return companies, such as Bunzl, which do not offer the prospect of immediate high share price appreciation. Source: Marathon, Credit Suisse HOLT. The conditions leading to Purchase Candidate B often stem from the market misjudging the beneficial effects of reduced competition as weaker firms disappear, either through consolidation or bankruptcy. Alternately, an unruly oligopoly may tire of excess competition and enjoy an outbreak of peaceful coexistence. The turn in the capital cycle often occurs during periods of maximum pessimism, as the weakest competitor throws in the towel at a point of extreme stress. When the pain of losses coincides with a depressed share price, investors can find wonderful opportunities, particularly if they are willing to take a multiyear view and put up with short-term volatility. Management skill at dealing with problems may also be overlooked. This is especially true when a new leader is recruited externally, maximizing the possibility of change. The turnaround achieved at Fiat by Sergio Marchionne in recent years is one outstanding example. Highly competent managers are often attracted by the challenge of turning around a troubled company, not least because of the financial rewards. Most investors devote more time to thinking about demand than supply. Yet demand is more difficult to forecast than supply. Changes in supply drive industry profitability. Stock prices often fail to anticipate shifts in the supply side. The value/growth dichotomy is false. Companies in industries with a supportive supply side can justify high valuations. Management’s capital allocation skills are paramount, and meetings with management often provide valuable insights. Investment bankers drive the capital cycle, largely to the detriment of investors. When policymakers interfere with the capital cycle, the market-clearing process may be arrested. New technologies can also disrupt the normal operation of the capital cycle. Generalists are better able to adopt the “outside view” necessary for capital cycle analysis. Long-term investors are better suited to applying the capital cycle approach. Given that the future is uncertain, why should Marathon’s approach fare any better? The answer is that most investors spend the bulk of their time trying to forecast future demand for the companies they follow. The aviation analyst will try to answer the question: How many long-haul flights will be taken globally in 2020? A global autos strategist will attempt to forecast China’s demand for passenger cars 15 years hence. No one knows the answers to these questions. Long-range demand projections are likely to result in large forecasting errors. Capital cycle analysis, however, focuses on supply rather than demand. Supply prospects are far less uncertain than demand, and thus easier to forecast. In fact, increases in an industry’s aggregate supply are often well flagged and come with varying lags – depending on the industry in question – after changes in the industry’s aggregate capital spending. In certain industries, such as aircraft manufacturing and shipbuilding, the supply pipelines are well-known. Because most investors (and corporate managers) spend more of their time thinking about demand conditions in an industry than changing supply, stock prices often fail to anticipate negative supply shocks . One of the most significant factors keeping investors from reaching appropriate conclusions is their tendency to assess the world with emotionalism rather than objectivity. Their failings take two primary forms: selective perception and skewed interpretation. In other words, sometimes they take note of only positive events and ignore the negative ones, and sometimes the opposite is true. And sometimes they view events in a positive light, and sometimes it’s negative. But rarely are their perceptions and interpretations balanced and neutral. ...investor psychology rarely gives equal weight to both favorable and unfavorable developments. Likewise, investors’ interpretation of events is usually biased by their emotional reaction to whatever is going on at the moment. Most developments have both helpful and harmful aspects. But investors generally obsess about one or the other rather than consider both. ...It all seems so obvious: investors rarely maintain objective, rational, neutral and stable positions. First they exhibit high levels of optimism, greed, risk tolerance and credulousness, and their resulting behavior causes asset prices to rise, potential returns to fall and risk to increase. But then, for some reason – perhaps the arrival of a tipping point – they switch to pessimism, fear, risk aversion and skepticism, and this causes asset prices to fall, prospective returns to rise and risk to decrease. Notably, each group of phenomena tends to happen in unison, and the swing from one to the other often goes far beyond what reason might call for. That’s one of the crazy things: in the real world, things generally fluctuate between “pretty good” and “not so hot.” But in the world of investing, perception often swings from “flawless” to “hopeless.” The pendulum careens from one extreme to the other, spending almost no time at “the happy medium” and rather little in the range of reasonableness. First there’s denial, and then there’s capitulation. Engaging in routines that allow you to maintain objectivity are, of course, very helpful to cognition. We all remember that Darwin paid special attention to disconfirming evidence, particularly when it disconfirmed something he believed and loved. Routines like that are required if a life is to maximize correct thinking. And one also needs checklist routines. They prevent a lot of errors, and not just for pilots. You should not only possess wide-ranging elementary wisdom but also go through mental checklist routines in using it. There is no other procedure that will work as well. Link to Memo: What Does the Market Know? In Thursday’s memo, “On the Couch,” I mentioned the two questions I’d been getting most often: “What are the implications for the U.S. and the rest of the world of China’s weakness, and are we moving toward a new crisis of the magnitude of what we saw in 2008?” Bloomberg invited me on the air Friday morning to discuss the memo, and the anchors mostly asked one version or another of a third question: “does the market’s decline worry you?” That prompted this memo in response. In this white paper James Montier attempts to show why the proponents of sound finance are mistaken by defining and unpacking a series of “myths” that are foundational to, or at least helpful to, convincing us that sound finance requires that governments run a balanced budget. Since October, the economic evidence has shifted from supporting a growing risk of recession, to a guarded expectation of recession, to the present conclusion that a U.S. recession is not only a risk but an imminent likelihood, awaiting confirmation that typically only emerges after a recession is actually in progress. The reason the consensus of economists has never anticipated a recession is that so few distinguish between leading and lagging data, so they incorrectly interpret the information available at the start of a recession as “mixed” when, placed in proper sequence, the evidence forms a single, coherent freight train. While I’m among the only observers that anticipated oncoming recessions and market collapses in 2000 and 2007 (shifting to a constructive outlook in-between), I also admittedly anticipated a recession in 2011-2012 that did not emerge. Understand my error, so you don’t incorrectly dismiss the current evidence. One of the most notable behavioral traits among investors is their tendency to overlook negatives or understate their significance for a while, and then eventually to capitulate and overreact to them on the downside. I attribute a lot of this to psychological failings and the rest to the inability to appreciate the true significance of events. As negatives accumulate – whether they surface for the first time or just are finally recognized as significant – eventually a time comes when they can no longer be ignored, and instead they come to be treated as being of overwhelming importance. I woke up early on Saturday, December 12 – the morning after a day of significant declines in stocks, credit and crude oil – with enough thoughts going through my mind to keep me from going back to sleep. Thus I moved to my desk to start a memo that would pull them together. I knew it might be a long time between inception and eventual issuance, since every time I dealt with one thought, two more popped into my head. In the end, it took a month to get it done. Professor Richard Thaler of the University of Chicago is a leading expert on behavioral economics and decision-making (in fact, he’s such a significant figure in the field that he was given a cameo role in the movie The Big Short). He opens his new book, Misbehaving, with Vilfredo Pareto’s assertion that “the foundation of political economy and, in general, of every social science, is evidently psychology.” I’d apply that equally to the not-so-scientific field of investing. It has been one of my constant refrains – dating back all the way to “Random Thoughts on the Identification of Investment Opportunities” (January 1994) – that in order to be successful, an investor has to understand not just finance, accounting and economics, but also psychology. A thorough understanding of how investors’ minds work is essential if one is to figure out where a market is in its cycle, why, and what to do about it. For me, the markets’ recent behavior – certainly on December 11, but also at other points in 2015 – reinforces that observation. This memo is my attempt to send the markets to the psychiatrist’s couch, and an exploration of what might be learned there. Generally speaking, where Berkshire has the power, we try to be more than fair to the minority who don’t have the power and who depend on us. You can say, “Aren’t they wonderful, moral people?” I’m not sure we get credit for a lot of morality because we early knew how advantageous that would be to get a reputation for doing the right thing and it’s worked out well for us. And my friend Peter Kaufman said, “If the rascals really knew how well honor worked, they would come to it.” It really has worked well. People make contracts with Berkshire all the time because they trust us to behave well where we have the power and they don’t. There’s an old expression on this subject, which is really an expression on moral theory: “How nice it is to have a tyrant’s strength and how wrong it is to use it like a tyrant.” It’s such a simple idea but it’s a correct idea.